This article describes the fastest way of OData Services creation using ABAP Core Data Services. Details on @OData.publish annotation utilization, reference to Data Source CDS-Entity and import from DDIC Structure are given. Create, Update and Delete actions are shown on the custom transparent table data just to simplify the article and not to move focus from OData Service creation to business process requirements implementation. During CDS activation OData service will be generated in the background. If you are using complex CDS with associations (for Master-Details view, for example) you should additionally create Associations and Navigation Properties. This section will be added. For “CRUD” type of OData Services we should set parameters of Entity Set and then implement each of them. IF lv_top IS NOT INITIAL. lv_max_index = lv_top + lv_skip. IF lv_skip IS NOT INITIAL. 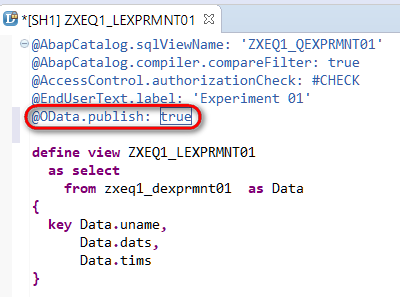 IF io_tech_request_context->has_inlinecount( ) = abap_true. This article shows a fast and simple way of OData Service creation with full CRUD functions support based on ABAP CDS technology. It is possible to see that wrapper for CRUD OData Service based on ABAP CDS could be created as fast as a few hours activity. What is needed is simply to add ABAP logic inside it that is mostly the same kind of activities we’ve done in ABAP development before web services usage. Additionally, OData Service created on ABAP CDS views is ready to be consumed by SAP HTML5 (UI5) Application and could either be deployed to your company local SAP Fiori Launchpad or to SAP Fiori Cloud Launchpad (Portal) from SAP Cloud Platform. P.S. Please consider that in case of SAP Fiori Cloud Launchpad usage we have to wrap OData Service using SAP Cloud Platform OData Provisioning Service (that is covered in another article).